Cats can have “cavities”, fractured teeth and develop gingivitis too. However, due to their ability to “hide” discomfort and pain, it is commonly overlooked and under-treated. The American Veterinary Dental Society estimates that 75% of cats over 3 years of age are in need of dental care and studies show that 50% of cats over five have tooth resorptive lesions. 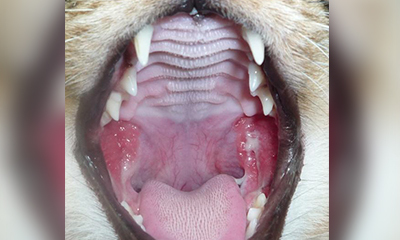 Stomatitis is another painful condition in cats that respond favorably to full mouth extraction therapy. Dental X-ray revealing tooth and root damage due to tooth resorption. Tooth resorptive lesion with dental x-ray revealing Moderate root resorption. Cats are masters at hiding pain or illness. Fortunately, in a quiet setting, we can identify most patients in need of treatment (missing teeth, gum redness, gum recession) and we are equipped to safely anesthetize and treat any or all diseases cats develop. 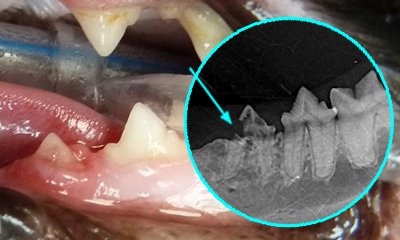 Studies show that 42% of cats have dental disease that can only be diagnosed by dental X-rays. Another study showed that 70% or purebred cats and 40% of mixed breed cats have tooth resorptive lesions. Moreover, treatment of these tooth resorptive teeth requires dental X-rays. 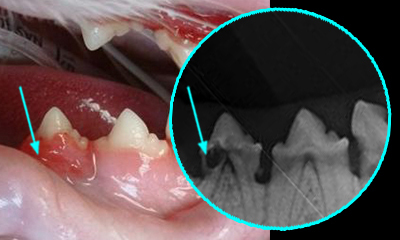 Our familiarity with cat’s tooth/bone anatomy, using surgical extraction techniques and attention to pain management allows us to treat moderate to severe cases with a rapid return to eating and comfort. Procedural photographs will be shared with you and your veterinarian to illustrate our treatment.